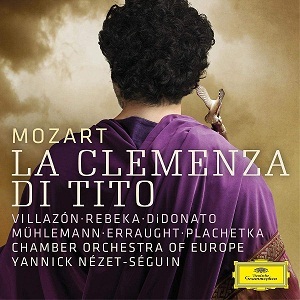 I have loved Mozart’s La Clemenza di Tito for more than 50 years, since as a teenage fan of the great Teresa Berganza, I snapped up Decca’s 1967 trail-blazing release of Mozart’s High Classical masterpiece, conducted by Istvan Kertész. Heading a cast of young stars that included Maria Casula, Lucia Popp, Werner Krenn and Brigitte Fassbaender, the great Spanish mezzo put her unforgettable stamp on the opera’s pivotal role of Sesto. Mozart’s once-neglected final opera seria has long since reclaimed its rightful position among the pantheon of his operatic greats, with more than a dozen commercial recordings entering the lists. Deutsche Grammophon’s recent release with Yannick Nézet-Séguin at the helm is both a notable addition of the work’s discography, and to the Canadian conductor’s distinguished Mozart opera series, captured from live concert performances in Baden-Baden. Joyce DiDonato’s searing portrayal of the guilt-wracked Sesto, who plots unsuccessfully to assassinate the Roman Emperor Titus, sets a new bench mark for the role, while Marina Rabeka’s spit-fire Vitellia runs her a close second, both in dramatic commitment and visceral vocality. If Rolando Villazon’s overly emotive take on the opera’s magnanimous title character strays beyond the bounds of performance style appropriate to this repertoire, there is no gainsaying the tenor’s generosity of spirit, or the glamour of his rich vocal palette.